Behavioral economists have extensively argued against consequentialist theories of social trust. The most recent studies show that trust decisions are mainly expressive. Trust-taking behavior is non-consequential and linked to betrayal aversion, norms, and self-identity. Trustfulness is thus granted an affective and normative dimension. Yet these studies lack an integrative theoretical framework. In light of these results, this paper argues that reaching a more comprehensive understanding of the notion of social trust may draw on conceptual resources and empirical insights from moral psychology. Specifically, future studies may test and explore further the non-consequential aspects of social trust in connection with moral reasoning and moral identity. BANU, Maria. Why Do We Trust Strangers? Social Trust, Moral Reasoning and Identity. 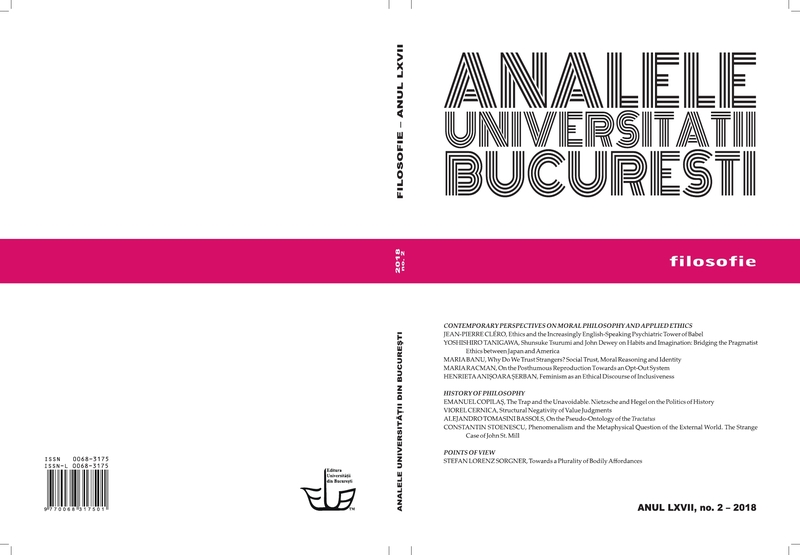 Annals of the University of Bucharest - Philosophy Series, [S.l. ], v. 67, n. 2, p. 39-66, apr. 2019. ISSN 0068-3175. Available at: <http://annals.ub-filosofie.ro/index.php/annals/article/view/278>. Date accessed: 26 apr. 2019.